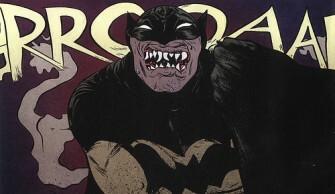 In the course of an interview to appear on CR this Sunday, the cartoonist Lynda Barry revealed that in her guest-editing stint on the next Best American Comics volume, the book and its publisher Houghton Mifflin were denied permission to reprint an excerpt from one of her favorite comics of recent vintage: Batman Year 100. "I adored Paul Pope's Batman 100," Barry says in the piece. "His version of Batman gave me the same feeling I had when I read Batman as a kid. There was something so alive and beautifully drawn about it. Unfortunately, DC refused to grant permission to include it in The Best American Comics 2008 and it was clear that no DC superhero comic could ever be included in the collection." Matt Madden, one of the current permanent series editors along with wife, cartoonist and fellow comics educator Jessica Abel, confirmed that they were denied permission for the story. "It's true," he told CR. "After many many attempts at various levels, DC declined to let us run an excerpt from Batman Year 100." Madden says at one point they even brought DC's Bob Schreck into the discussion, "not that it ended up helping for all his good efforts." (Schreck declined to comment on the story.) He also said he was unclear as to DC's reasoning. "I'm not sure that they even gave an explicit reason, my understanding is they simply said no." One place where he differs with Barry is that Madden was unclear whether or not this was an all-DC ban or specific to the Paul Pope project. "We still haven't heard back about whether this applies to all DC/WB product (Vertigo titles for example) or just their main franchises." An e-mail to Madden's direct liaison on the project at H-M, Anjali Singh, was not answered. Singh was apparently involved in the negotiation on the Best American Comics series behalf. As for the cartoonist and creator of the well-received mini-series, Paul Pope further confirmed the refusal and described what he saw from his perspective on the negotiation. "I know there were people both at DC and HM who campaigned very hard to convince DC as to the benefits and soundness of having my Batman pages appear in the collection," the popular artist and designer wrote to CR. The benefits would seem rather obvious to most. I have since found out it was not because of licensing money that DC refused (I don't know the actual reason to be honest, but it wasn't money, the only thing I could legitimately see as being an impediment in this case...)." He added, "DC's formal refusal letter was one line." Pope said that he was contacted fairly only on in the process by Madden and Abel to try and get the comics publisher to OK the addition. "I made formal requests, as did Lynda and a number of other people with some degree of influence." One unfortunate outcome is that it may have kept Pope from the book altogether. "Jessica and Matt said not to worry, because if DC would not allow the addition of my Batman pages, they would be running my story "Fun! Comics" -- from THB:CFM #1, which debuted at SDCC that year -- so I would be in the collection regardless. Despite the fact that I own THB and Batman was a work for hire project, I wanted to see the Batman pages run in the book as well, so I lobbied for that. Lynda had been searching for some superhero material to add to the series, mine fit the bill. Her intention was to shed light on quality material from the so-called 'mainstream' of comics. I'm all for that. "Months went by and I figured the matter was dead in the water, que sera sera. Then I get an email in the 11th [hour] from HM, letting me know they were about to go to press and were still trying to get DC to OK the addition of the Batman pages. In the end, DC took so long to formally deny the request that it not only prevented the Batman pages from running, it also forced HM to go ahead with the book without any material from me at all." DC was given a chance to formally respond -- they were also given several weeks' heads-up on the possibility of this short news story -- and that response was, "No comment." 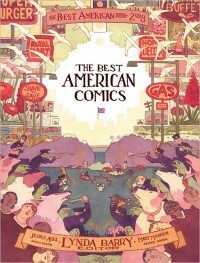 The Best American Comics 2008 is scheduled for release in October.